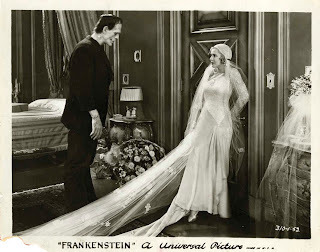 The Phantom demands Christine to spend the rest of her life with him in "The Phantom of the Opera". 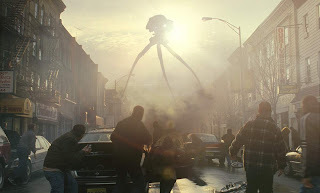 I think that Spielberg's "War of the Worlds" is one of the best monster movies in recent years. 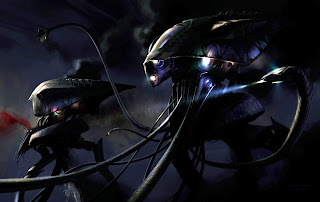 The tripods are so incredibly scary. Remember that terrible sound they make? But it's not really Paris! 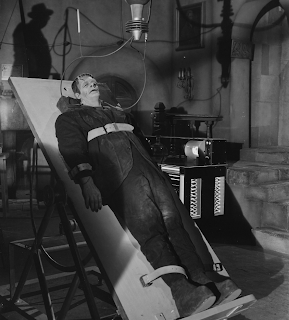 It's Universal Studios during production of "Hunchback of Notre Dame". 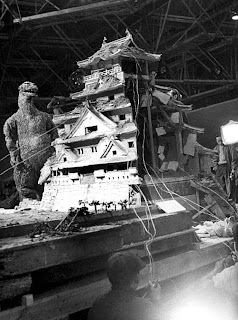 Here is a rare behind the scenes shot of the destruction of Tokyo. 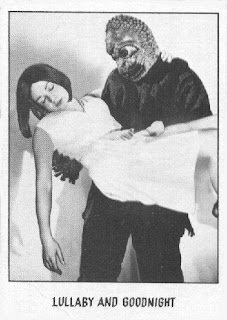 I think this is from "King Kong vs. Godzilla". Such an amazing amount of detail. 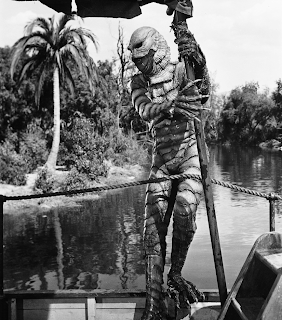 It's everyone's favorite Gillman "The Creature From the Black Lagoon"! "Haul in the sheet and make it fast!" 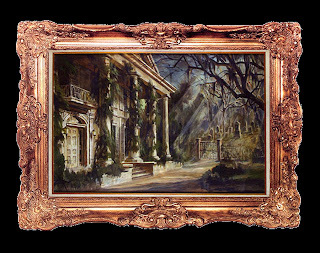 This is the painting from the "Night Gallery" TV movie segment entitled "The Cemetery". 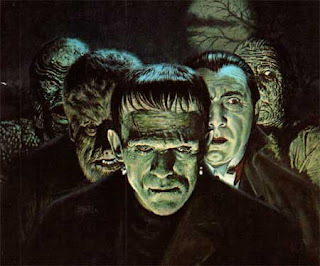 I can't tell you how much this scared me when I was a kid. 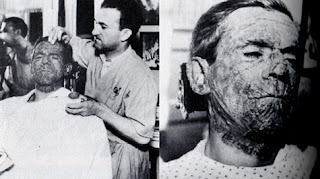 It is still very effective today. 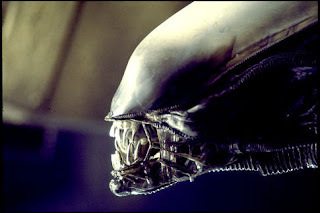 Here are some shots of one of the scariest movie monsters ever created: "Alien"! 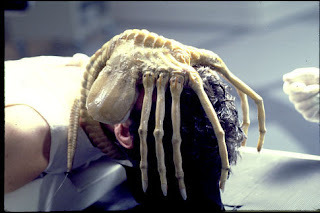 A Face Hugger finds a cozy place to rest. Imagine finding that smiling back at you! 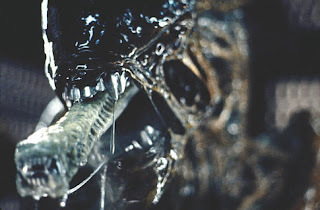 This is such a grotesque creature. It's awesome! 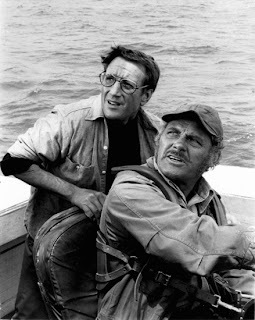 Chief Brody and Quint have the task of capturing the great white shark in "Jaws". "You catch the shark and I'll hide behind you!" 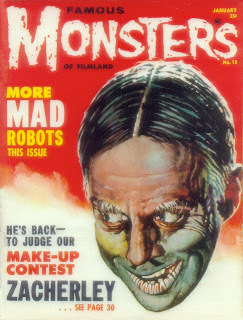 "Mr. Talbot! You forgot your grip!" 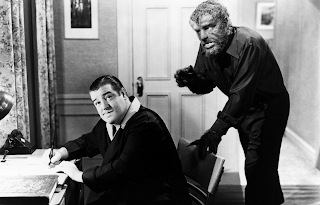 Wilbur Grey (Lou Costello) is unaware he is being stalked by The Wolf Man (Lon Chaney, Jr.) in "Abbott and Costello Meet Frankenstein". 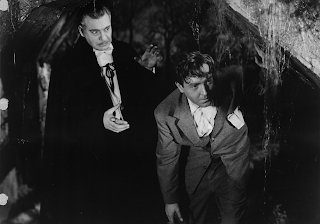 Bela Lugosi as Dracula and Dwight Frye as Renfield. "Please! Don't send me to bed without supper!" 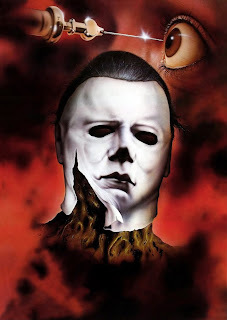 If I remember correctly, this art was done for a Japanese movie poster of "Halloween II". 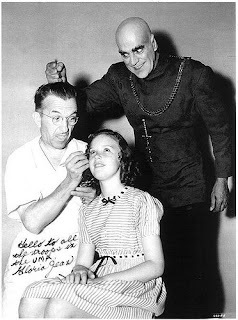 During this scene, Boris Karloff would wiggle his pinky so Mae Clarke would know still know it was that kind man under the hideous make-up. 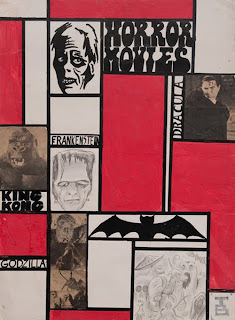 This is an art piece that was done by a young Tim Burton. 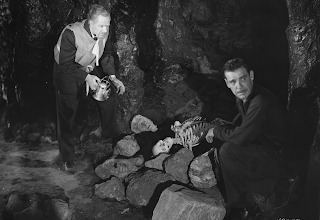 Dr. Edelman and Lawrence Talbot find the remains of the Frankenstein Monster and Dr. Niemann in "House of Dracula". 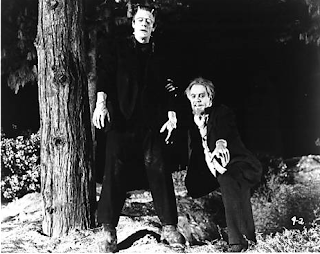 "We found a gruesome twosome!" "Quiet... 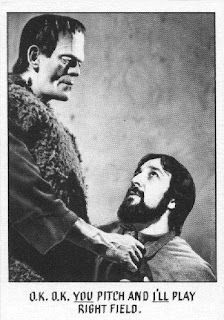 I'm reading about Rick Baker: Monster Maker!" 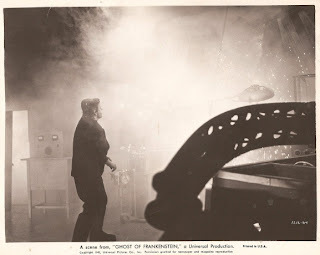 The Monster is in a hot predicament at the climax of "Ghost of Frankenstein". 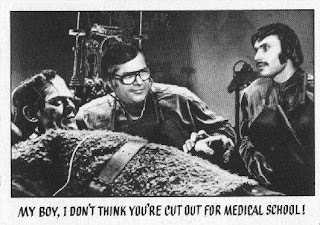 Fire is no good to Frankenstein. This is another behind the scenes shot from "Tower of London". 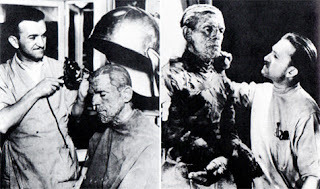 Karloff really seemed to be pissed off at pierce for shaving his head! "She gets golden locks and what do I get?" Who's shadow is that behind Frankenstein? It's not a villager. 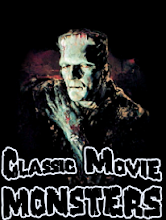 It is the director of "House of Frankenstein", Erle C. Kenton! 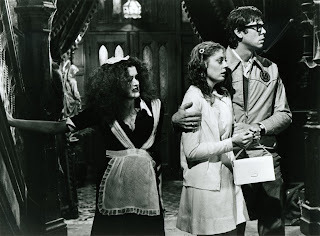 It's the "Rocky Horror Picture Show"! 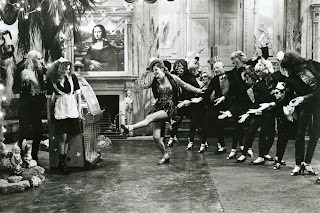 Little Nell tapping the Time Warp. Two girls and a sweet transvestite. 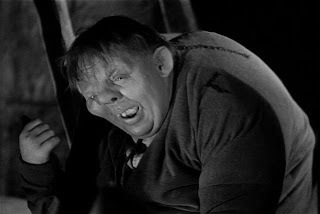 It's Charles Laughton as Quasimodo! 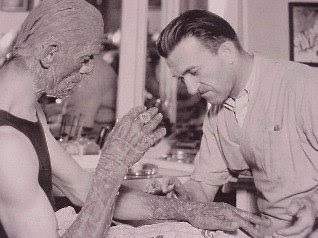 Here are some rare shots of Jack Pierce turning Boris Karloff into "The Mummy". 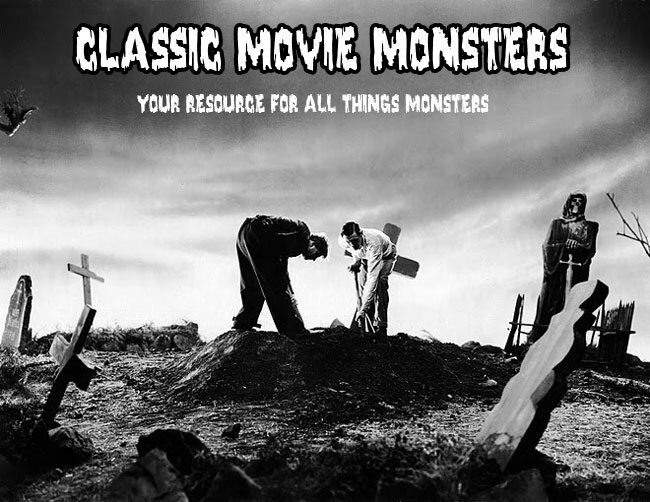 Lon Chaney, Jr. is the "Son of Dracula"! 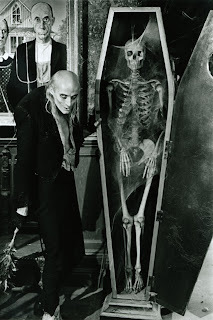 "My coffin is this big." 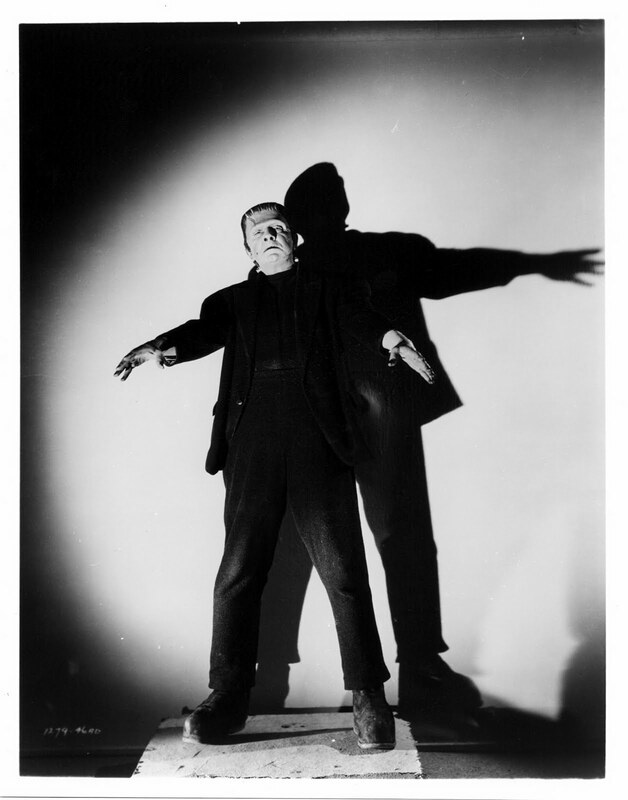 Bela Lugosi as the Frankenstein Monster in "Frankenstein Meets the Wolf Man". "What good is a mouth without lines to speak?" 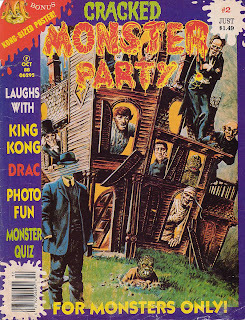 I love the Cracked Monster Party issues. 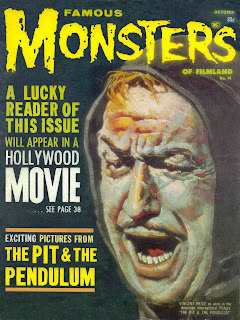 They always have such great covers. 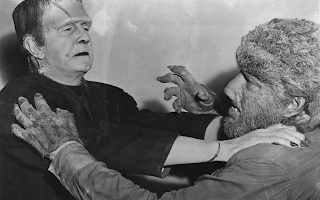 Bela Lugosi and Lon Chaney, Jr battle in "Frankenstein Meets the Wolf Man". 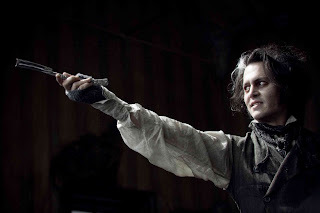 A few shots from Tim Burton's "Sweeney Todd: The Demon Barber of Fleet Street". 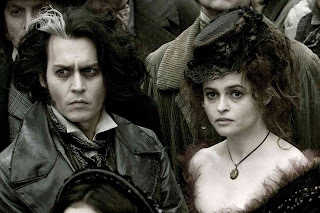 "You shall drip precious rubies." "Pirelli's Miracle Elixir is concocted from piss and ink." 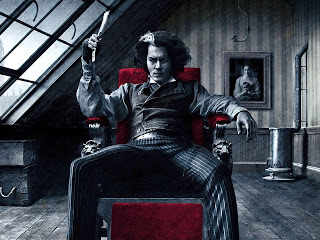 "Judge is on the menu!" 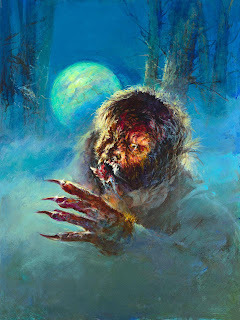 This is a painting by Famous Monsters cover artist Basil Gogos of the Benicio Del Toro "Wolf Man". I really love the painting! Basil is still the best! 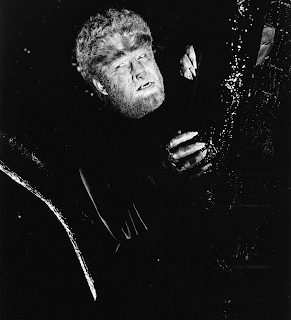 Here is Lon Chaney, Jr. from "The Wolf Man". 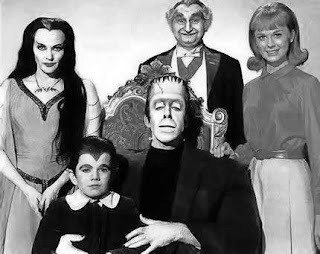 his father's side of the family. 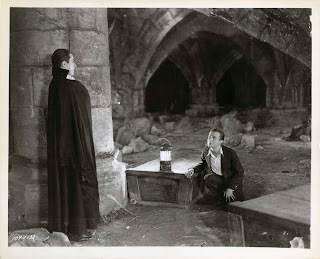 This shot is from Onslow Stevens's dream sequence in "House of Dracula". "I gave you the strength of 100 men. 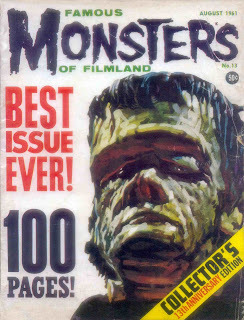 Now kill 100 men!" I used to have these paddles when I was a kid. They are very neat. 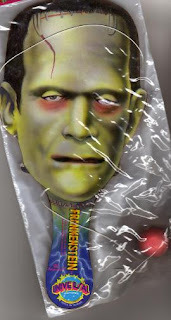 I like the Dracula one a lot since it is a rare 1990s item with Lugosi's likeness. His Mother Was the Lightning! 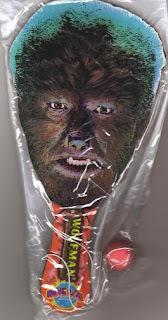 The Guy Growls Like a Wolf! 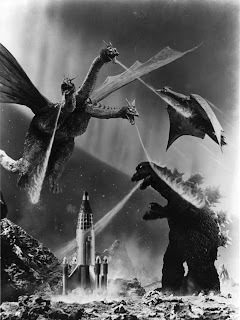 Monster Movie Posters: "Godzilla Vs. Megalon"
Time's Man of the Year!